Trent Nelson | The Salt Lake Tribune Alta High School student Emma Smith presents her mobile app idea Dr. Stocker at the IPOP Foundation's second annual Mobile App Idea Competition in Sandy, Tuesday April 1, 2014. 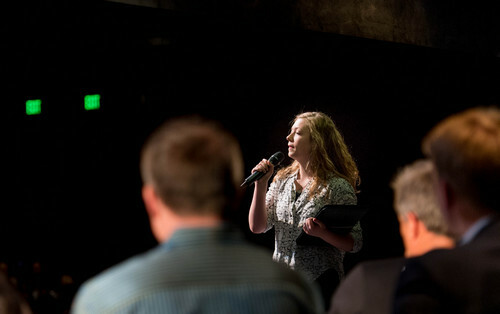 Trent Nelson | The Salt Lake Tribune Alta High School student Beth Phouthavonysay presents her mobile app idea Lighthouse at the IPOP Foundation's second annual Mobile App Idea Competition in Sandy, Tuesday April 1, 2014. Trent Nelson | The Salt Lake Tribune Alta High School student Nathan Hood presents his mobile app idea Stick Talk at the IPOP Foundation's second annual Mobile App Idea Competition in Sandy, Tuesday April 1, 2014. 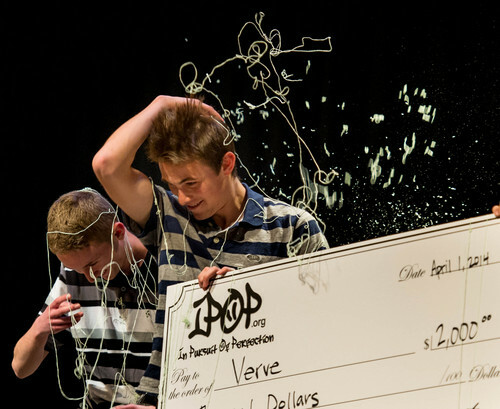 Trent Nelson | The Salt Lake Tribune Alta High School students Matt Blake and Zach Gundry are covered in silly string after taking first place at the IPOP Foundation's second annual Mobile App Idea Competition with their mobile app Verve, in Sandy, Tuesday April 1, 2014. Trent Nelson | The Salt Lake Tribune Alta High School students Zach Gundry and Bryan Luu react to taking first place at the IPOP Foundation's second annual Mobile App Idea Competition with their mobile app Verve, in Sandy, Tuesday April 1, 2014. Sandy • Three spunky Alta High School teens  Brian Luu, Zach Gundry and Matt Blake  just came up with a million-dollar idea for a mobile app. Well, at least a $2,000 idea. The trio of students are the winners of this year&apos;s annual IPOP Kick-App Idea Competition with their idea for a social-gaming mobile app called "Verve" that invites users to top other users in all kinds of everyday competitions from kicking a football the farthest to jump-roping the longest. With their app, you just pick the competition you want to best and then take a picture or video of your attempt that you post on a network. 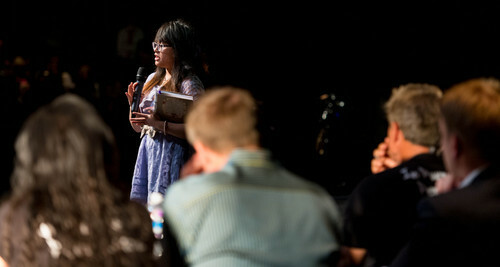 "People always love competitions, and anyone can do it," said Luu about why they came up with the idea for "Verve." As a result of winning, Luu, Gundry and Blake got a $2,000 scholarship check and a free trip to the University of Utah to work with engineers to possibly turn their idea into a mobile-app reality. They also will be getting a call from one of the equity investors who judged the competition. "&apos;Verve&apos; has huge potential," said Warren Osborn, CEO and managing partner of Provo-based venture capital firm Osborn Companies, who will be contacting the teens. 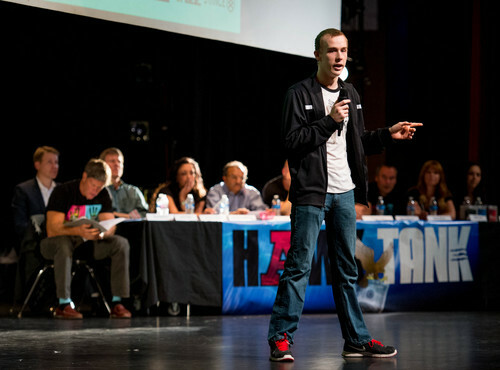 In an Alta High assembly Tuesday that was part ABC&apos;s entrepreneurial reality TV series "Shark Tank" and part pep rally, 10 teams took the stage and made three-minute pitches to a panel of local venture capitalists. One of the ideas that won the audience award voted on by Alta students was "Airwave" by students Bridger Pennington and Rocky Evans. Their app allows someone with a smartphone to broadcast a video or song to other smartphones in real time so everyone can see the content together without huddling around one screen. 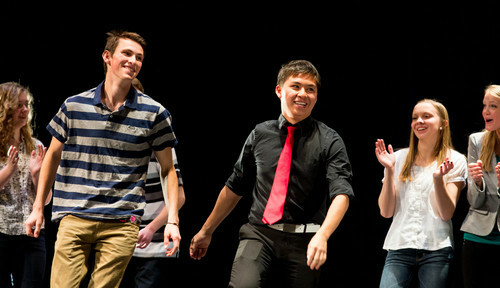 The duo also won the competition&apos;s second-place award. Student Nathan Hood came up with a social app called "Stick Talk" that&apos;s similar to the blockbuster video messaging app, "Snapchat," but with your voice. A user can record a voice message and send it to a friend, and an always-changing stick figure is used as an avatar. "Nothing I&apos;ve found uses your voice," Hood said about other "Snapchat" clones. Not all apps were for just fun and games. Student Beth Phouthavonysay came up with the idea for "Lighthouse," a mobile app that sends out a virtual SOS if the user is in a threatening situation, say if they are being kidnapped, about to be attacked or just on a horrible date. Then there was one app from student Kyiler Fowler that warns you where the police are in your area. Given a name that is derogatory for police officers (Kyiler didn&apos;t mention whether he would change the title), the app pings the user and lets him or her know where a police officer is nearby. But Kyiler, who came up with the idea with his mom and uncle, said it wasn&apos;t necessarily meant to avoid trouble so much as to keep the user&apos;s own behavior in check. "It&apos;s not to avoid the police but to give you alerts so you can drive safely or be respectful," he said. Osborn said the ideas from the students were some of the best he had ever heard from aspiring app developers. "I&apos;ve looked at literally 20,000 ideas," he said. "Some of these are the best I&apos;ve ever heard. Some of these have massive potential." Amy Rees Anderson, co-founder and director of the IPOP (In Pursuit of Perfection) Foundation, which promotes entrepreneurship with young people, said she started the competition to help spur creativity in teens. "I&apos;m an entrepreuner and my goal was to give back. We wanted them to see that entrepreneurship is all encompassing," she said. "Some of these are better ideas than what adults have come up with because they [teens] use it [apps] in a way we don&apos;t."